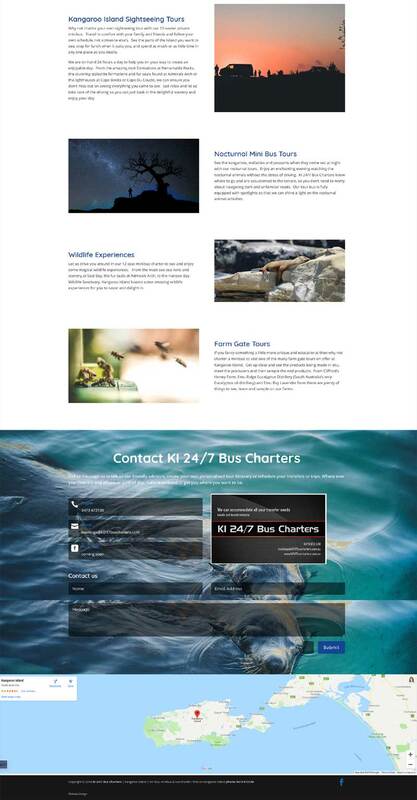 Colin Childs at KI 24/7 Bus charter came to Website Adelaide wanting a cost-effective single page website built for the business he was launching on Kangaroo Island. He needed his website to be launched quickly as he wanted to grow his business with the key tourist season approaching. With limited time and digital marketing experience, Colin chose the ‘Done for Me’ package for a single page website. Website Adelaide sorted out his hosting and built a responsive, mobile-friendly WordPress website. Colette Chorley Creative Content and Marketing interviewed Colin and researched Kangaroo Island to create the content for his pages within two business days. His website was launched within 10 days of him contacting Website Adelaide. Colin was delighted with the end result and happy with how easy and ‘ Stress-free’ the whole process had been.